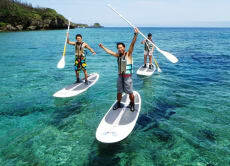 Try a Stand Up Paddle adventure in Okinawa! I had questions about booking the tour and the itinerary. Voyagin answered all my questions instantly. Great customer service! It was an amazing tour. My boyfriend and I loved every second of it. Definitely would do it again. We went on the kayaking and snorkel package with AruGuide today, and let me tell you, it was such a great time. Our guide Maco San was very professional, experienced, and fun! His English is impeccable and he made sure to explain everything thoroughly for all of our group to understand. If you are looking for a fun and safe experience of kayaking and snorkeling, I highly recommend AruGuide, and most definitely Maco San! You will have a blast! We had a great time kayaking to the blue cave and snorkelling the area around it. The guide was prompt and professional.